Canterbury’s Sean Stapleton admits victory over Henley Hawks on Saturday afternoon would give his side some breathing space as the race for the play-off spot in National Two South continues. Both teams head into this weekend having won their last seven matches, but it’s the City Men who currently occupy second spot in the division. Canterbury sit four points clear of Henley and Stapleton is aware of how significant a victory will be with just five games remaining in the season. “A win will just give us a little bit more breathing space because for the whole season, it has been really close,” Stapleton said. “It is a massive game at the weekend and if we can get the win, it gives us that cushion. “To be honest, we don’t look too far ahead. You can’t really look past Henley when you’ve got them coming up this weekend. In an interview with ncarugby.com earlier in the season, Canterbury head coach Andy Pratt insisted his squad needed to stay focused if they were to maintain a top two challenge and the Kent outfit have done just that. “I think for us it is just a matter of sticking to one game at time,” Stapleton added. “The last couple of weeks, we did play teams who are struggling towards the bottom so we just needed to focus on trying to get five points every time. “Where we are now, is really good. It brings a whole new buzz around the club. You see more and more people coming to the games. Stapleton, who is a former product of the Connacht academy, joined Canterbury at the beginning of the season from fellow National Two South outfit Bury St Edmunds. Whilst Bury concluded last term in eighth place, Canterbury had to settle for 10th but Stapleton insists his current side are now showing what they are truly capable of. “The reason for the move was because of a job opportunity down here,” Stapleton said. “I already knew a couple of the players who were here like Sam Sterling who had signed originally from Bury. It was a big decision, but I am very happy I have done it. 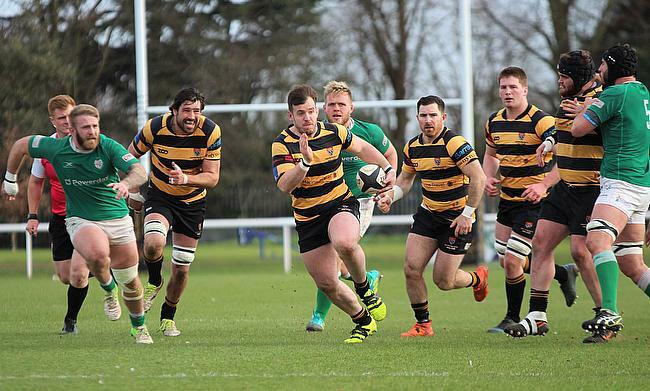 Canterbury’s recent form has kept them in pole position for the play-off spot and arguably this weekend’s clash with Henley is their biggest hurdle they have to overcome between now and the end of April. Following on from Round 26, Stapleton will come up against his old club Bury before facing Old Albanian, Barnes and champions elect Rams RFC. However, Henley is their next challenge and having beaten the Hawks 32-29 earlier in the season as well as racking up 14 consecutive home wins, Stapleton is hoping his side can take a huge step towards a top two finish on Saturday. He added: “You always have to be confident in your own abilities. Henley are obviously a fantastic team. They are coming to our place and we have made it a bit of a fortress, but there is no doubt we can take things from the win earlier in the season. “At the start of the season, we said we wanted to make our home a fortress which we have done. You’re at your own place and you’re in front of your own people and that adds to the big club atmosphere.